Chylothorax is the accumulation of chyle in the pleural cavity as a result of damage to the lymphatic ducts. We treated a young man who was a kidney transplant recipient who had a prior internal jugular vein permanent catheter for hemodialysis, who developed dyspnea and hypoxemia. Chest radiography showed bilateral pleural effusion. Analysis of the white, milky, cloudy, odorless effusion fluid showed cell count > 500/μL; lymphocytes, 60%; total protein, 3.6 mg/dL; urea nitrogen, 45 mg/dL; creatinine, 90 μmol/L; triglycerides, above 2.2 mmol/L (repeatedly high); lactate dehydrogenase, 450 U/L (normal); and cultures, no growth. Magnetic resonance imaging showed thrombosis of the major neck veins, superior vena cava, and azygos vein. Treatment included pleural drains, gut rest, and dietary modification, octreotide, and warfarin. The chylothorax resolved with no relapse. In summary, chylothorax may occur in patients associated with thrombosis of major veins associated with a permanent dialysis catheter. In a previous report, a 12-year-old patient who had end-stage renal disease and treatment with chronic hemodialysis had a large left pleural effusion that was attributed to multiple hemodialysis access sites in the neck.8 Repeated reinfusion of chylothorax fluid into the patient was performed in a closed sterile circuit for approximately 7 weeks, to prevent the loss of protein- and T-cell–rich fluid until the chylothorax resolved spontaneously.8 Reinfusion of chylothorax fluid may be recommended in similar clinical settings. However, literature review showed limited information about chylothorax in young kidney transplant recipients. We treated a patient who had a chylothorax associated with kidney disease and thrombosis of neck veins. An 18-year-old Kuwaiti man had bilateral renal dysplasia and end-stage renal failure, and he had a living-related kidney transplant from his mother in April 1993. After 13 years, the graft was lost because of chronic transplant glomerulopathy, possibly from chronic cyclosporine toxicity. In September 2006, he started hemodialysis and had graft nephrectomy. He developed difficulties with vascular access and benign intracranial hypertension. Therefore, he had a living-unrelated kidney transplant in October 2009, after a desensitization protocol that included immunoadsorption for high panel reactive antihuman leukocyte antigen antibodies (85% for class I and 38% for class II), induction with thymoglobulin, and maintenance with mycophenolate mofetil, corticosteroids, and tacrolimus. The postoperative course was uneventful except for slow graft function because of biopsy-proven acute tubular necrosis and a urinary tract infection (Klebsiella pneumonie) that was treated with levofloxacin. Before discharge from the hospital, mycophenolate mofetil was changed to mycophenolate sodium because of persistent diarrhea, and the right internal jugular vein permanent dialysis catheter was removed. At 2 months after discharge, he developed dyspnea and hypoxemia. Chest radiography showed bilateral pleural effusion. Drainage of the effusion showed a white, milky, cloudy, odorless fluid consistent with a chylothorax (fluid analysis: cell count > 500/μL; lymphocytes, 60%; total protein, 3.6 mg/dL; urea nitrogen, 45 mg/dL; creatinine, 90 μmol/L; triglycerides, above 2.2 mmol/L (repeatedly high); lactate dehydrogenase, 450 U/L (normal); and cultures, no growth. Echocardiography showed normal ejection fraction, good systolic and diastolic function of both ventricles, and cardiac chambers having average size. Magnetic resonance imaging of the neck showed asymmetry of the right and left internal jugular veins and bilateral pleural effusion (Figures 1A and 1B). Computed tomographic angiography showed a tortuous and thrombosed left internal jugular vein and incomplete thrombi in the right internal jugular and bilateral subclavian and brachiocephalic veins. In addition, incomplete thrombus was observed in the superior vena cava, extending to the right atrium; complete thrombosis of the azygos vein; prominent vertebral veins; and a recanalized umbilical vein that communicated with the mammary veins (Figures 1C and 2). Bilateral pigtail drains were inserted into the pleural spaces for 3 weeks. Initial treatment included complete gut rest and total parenteral nutrition, and this was changed to a diet containing low fat level or medium-chain triglycerides. After persistence of the chylothorax, he was treated with octreotide (a long-acting somatostatin analog given subcutaneously) and heparin followed by warfarin, and he had a satisfactory response with complete resolution. In June 2011, the patient was readmitted because of kidney graft dysfunction. Biopsy of the graft showed acute antibody-mediated rejection, and he was treated successfully with plasma exchange through the femoral vein, intravenous immuno-globulin, and rituximab (1 dose). At the most recent follow-up (3 years after he had the chylothorax), graft function was stable, serum creatinine was 152 μmol/L, and he had no relapse of the chylothorax. In the present patient, oral feeding was associated with marked change in the color and biochemical constituents of the pleural fluid, similar to previously reported findings.14 Malignancy was excluded with computed tomography and magnetic resonance imaging scans of the chest and abdomen. The patient’s neck veins were used bilaterally for prolonged hemodialysis, which was complicated by thrombosis of both subclavian, internal jugular, and brachiocephalic veins, elevated central venous pressure, and benign intracranial hypertension. Diseases that may increase right-sided central venous pressure, such as restrictive pericarditis, central vein thrombosis, and right ventricular failure, may cause chylothorax. However, not all patients who have right-sided venous hypertension develop chylothorax.15,16 The development of chylothorax in such cases could be explained by the lymphaticovenous channels within the chest wall, which can contribute to lymphatic drainage in patients who have high central venous pressure.17 The present patient had an acute clinical presentation, likely because of the large amount of chyle drained by the thoracic duct.5 The frequency of mortality associated with chylothorax has reached approximately 10% in major medical centers. Previous reports have noted that patients with chylothorax may have further immunosuppression because of continued loss of proteins, immuno-globulins, and T lymphocytes into the chyle fluid and impaired B-lymphocyte–mediated immune function.22,23 These factors may predispose the patient to opportunistic infections.24 Therefore, we optimized immunosuppression by decreasing the dosage of mycophenolate mofetil by 50%, guided by the total lymphocyte count, and by keeping the tacrolimus level approximately 5 ng/mL. The patient initially was anticoagulated with heparin, followed by warfarin with international normalized ratio from 2 to 2.5, and he has had stable graft function without any relapse. 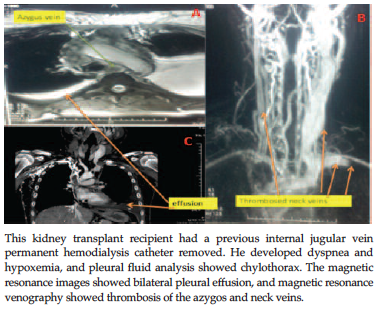 In summary, deep venous thrombosis of neck veins may complicate prolonged permanent catheter placement for hemodialysis and may cause right venous hypertension, which may cause bilateral chylothorax, even after kidney transplant. Successful treatment of chylothorax may be expected after tube drainage, dietary modification, octreotide, and anticoagulation. Nair SK, Petko M, Hayward MP. Aetiology and management of chylothorax in adults. Eur J Cardiothorac Surg. 2007;32(2):362-369. Paes ML, Powell H. Chylothorax: an update. Br J Hosp Med. 1994;51(9):482-490. Clarke SA, Lakhoo K, Sherwood W. Somatostatin for intractable postoperative chylothorax in a premature infant. Pediatr Surg Int. 2005;21(5):390-391. Maskell NA, Butland RJ; Pleural Diseases Group, Standards of Care Committee, British Thoracic Society. BTS guidelines for the investigation of a unilateral pleural effusion in adults. Thorax. 2003;58(Suppl 2):ii8-17. Mohseni-Bod H, Macrae D, Slavik Z. Somatostatin analog (octreotide) in management of neonatal postoperative chylothorax: is it safe? Pediatr Crit Care Med. 2004;5(4):356-357. Rice TW, Milstone AP. 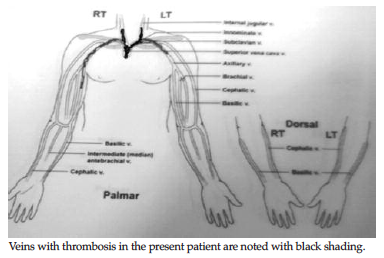 Chylothorax as a result of chronic lymphocytic leukemia: case report and review of the literature. South Med J. 2004;97(3):291-294. Skouras V, Kalomenidis I. Chylothorax: diagnostic approach. Curr Opin Pulm Med. 2010;16(4):387-393. Urizar RE, Kolnacki K, Kaslovsky R, Comber P, Siskin G, Dolen E. Chylothorax fluid autoinfusion in a chronic hemodialysis patient. Pediatr Nephrol. 2003;18(4):403-406. Milonakis M, Chatzis AC, Giannopoulos NM, et al. Etiology and management of chylothorax following pediatric heart surgery. J Card Surg. 2009;24(4):369-373. Sieczka EM, Harvey JC. Early thoracic duct ligation for postoperative chylothorax. J Surg Oncol. 1996;61(1):56-60. Molina Boix M, Ortega González G, Montoya Martínez JJ, Campos Peris V, García García J, Ruiz Ros JA. Chylothorax secondary to cardiac insufficiency [in Spanish]. Rev Clin Esp. 1987;181(9):507-509. Brenner WI, Boal BH, Reed GE. Chylothorax as a manifestation of rheumatic mitral stenosis: its postoperative management with a diet of medium-chain triglycerides. Chest. 1978;73(5):672-673. Berkenbosch JW, Monteleone PM, Tobias JD. Chylothorax following apparently spontaneous central venous thrombosis in a patient with septic shock. Pediatr Pulmonol. 2003;35(3):230-233. Robinson CL. The management of chylothorax. Ann Thorac Surg. 1985;39(1):90-95. Fossum TW, Birchard SJ. Lymphangiographic evaluation of experimentally induced chylothorax after ligation of the cranial vena cava in dogs. Am J Vet Res. 1986;47(4):967-971. Blalock A, Cunningham S, Robinson S. Experimental production of chylothorax by occlusion of the superior vena cava. Ann Surg. 1936;104(3):359-364. Lee FC. The establishment of collateral circulation following ligation of the thoracic duct. Bull John Hopkins Hosp. 1922;33(371):21-31. Fernández Alvarez JR, Kalache KD, Graŭel EL. Management of spontaneous congenital chylothorax: oral medium-chain triglycerides versus total parenteral nutrition. Am J Perinatol. 1999;16(8):415-420. Al-Zubairy SA, Al-Jazairi AS. Octreotide as a therapeutic option for management of chylothorax. Ann Pharmacother. 2003;37(5):679-682. Shah D, Sinn JK. Octreotide as therapeutic option for congenital idiopathic chylothorax: a case series. Acta Paediatr. 2012;101(4):e151-155. Servelle M, Noguès C, Soulié J, Andrieux JB, Terhedebrugge R. Spontaneous, post-operative and traumatic chylothorax. J Cardiovasc Surg (Torino). 1980;21(4):475-486. Wasmuth-Pietzuch A, Hansmann M, Bartmann P, Heep A. Congenital chylothorax: lymphopenia and high risk of neonatal infections. Acta Paediatr. 2004;93(2):220-224. Orange JS, Geha RS, Bonilla FA. Acute chylothorax in children: selective retention of memory T cells and natural killer cells. J Pediatr. 2003;143(2):243-249. Dumont AE, Mayer DJ, Mulholland JH. The suppression of immunologic activity by diversion of thoracic duct lymph. Ann Surg. 1964;160:373-383. Acknowledgements: The authors have no conflicts of interest to declare, nor did they receive any funding for this study.